Moving on in our project from last time where everyone had been tasked for a building to do over reading week as a basic model, nothing fancy not the end product just a basic model to see if everyone was going the right way about doing everything and to give constructive critique to them if needed. As Group Critique is a requirement in a learning objective that we are marked on in the course we needed to take this seriously and act in a professional manner, as we would in industry. Personally I felt i did this and then followed up my critique when spotting flaws in some peoples models by showing them ways to fix it after they presented their work to the class. Not doing the work for them but showing them ways that they can call upon in the future to rectify certain issues. For example James had Ngons in his model due to not having loops where they should be and therefore having extra verticies in places, just a quick resolve using either the cut tool or the connect tool and target weld. 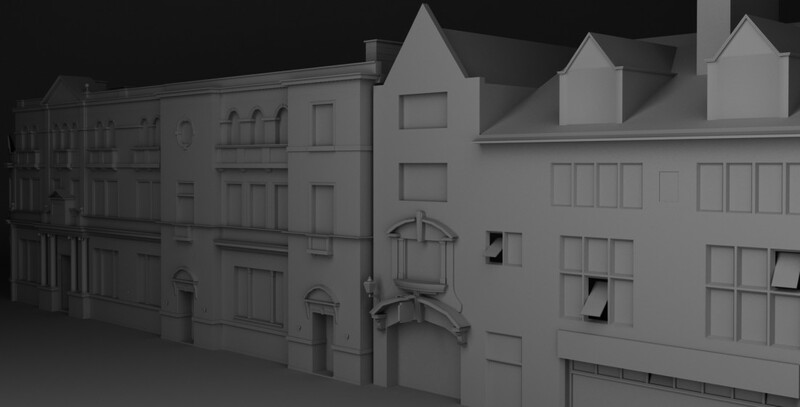 My buildings recieved good feedback from the group, Phil pointed out possibly the back part of Marks and Spencers was too far back in the model in relation to real life. I had noticed this but due to not having measurements of that particular area it was just a rough estimate. I will still address this issue and possibly ask Phil whilst i do this to agree on a placement, possibly throw it into unreal engine 4 in the block out to see if it has the right feel and look to it. Other thn that my building crawshaws was a basic model, the building having alot of elegant and elborate patterns or facures a basic model is alot to work on to the final product. 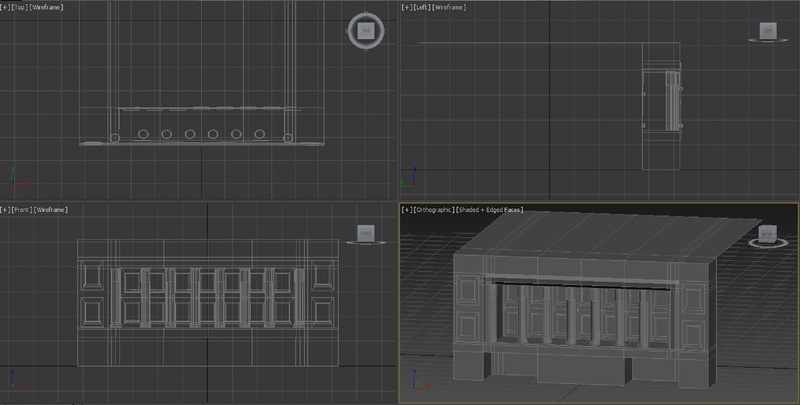 This all looks like one model due to having a simple grey texture placed onto all the seperate pieces, but all i did was model the building in a half then sue the symmetry modifier to model the other half, after that i modelled every piece seperate the pillars the windows were just one simple asset that i have duplicated and snapped together in the case of the windows to create the illusion that its all one model when actually its just lots of seperate pieces attached together to make a model. Im very leased with the progress of this so far and the scale has been nailed to a the tee thanks to the meter wheel making modelling alot easier for me. Then this is what is now crawshaws (still unconfirmed on what it was in the 60s as been unable to find any reference of it as of yet) looks alot more unfinished than m&s this is partially due to m&s taking longer but also because crawshaws has a very elegant facure with flowers and grapes etc on the building. so without them it is quite bland looking, i still need to model the top dome window part. And as you probably can tell due to not being on one side i havent needed to symmetry it yet otherwise it would be a step too soon. So thats where im at, i felt i could have been alot further along with this personally but this will be finished off soon no worries about that. With all being said and everyone present showcasing there buildings for critique i decided to take notes throughout the session to pin down any common themes brought up and also what our next steps could be, so that if its an issue the ones who are not having these issues could do some one to one tutoirals with any people stuggling to show our abilities to work as a group and give peer to peer learning. Texturing- General UV mapping, where to go next with the model, using different types of texture maps to improve the model, light maps, altas maps. Lighting- The use of lighting to bring out a model really show it off, interior lighting/mapping. Interior- generally everyone just designed the building from the outside, if we are going for realism surely the players will see through shop windows into the shops so a basic interior should be modelled with appropraite assets to fill it out and possible assets in relation to the football world cup theme we seem to be going with e.g. an idea i raised was flags on the windows and doors so that we wouldnt have to model the interior but that not be the case for every store as they will have a reputation, like a jewelers they will probably just have a simple pennant string with flags across a window its still showing support but its tasteful. Little details- many of us have little details on the facure of our building like my building crawshaws has some flowers and grapes aside the windows, we have recommended basic low poly models of these in 3ds max and then to import them into mudbox or zbrush to produce a normal map which will give them realism without huge polycounts. Which sculpting and detail tutorials will be called upon and taught by us as not many have used sculpting software before. Put into the engine- Most hadnt tested there buildings in the engine but we should be at the stage no matter how complete the buildings are to be enchancing our grey block out of the streets from basic bsp. so a collection next week of the building to go into the engine will be done regardless of building completion as at least we may identify scale issues or snapping issues etc. Texture importance- some people had over modelled certain part of their building. for example things like window panes had been modelled in when that is a simple texture and gives generally the same appearance. 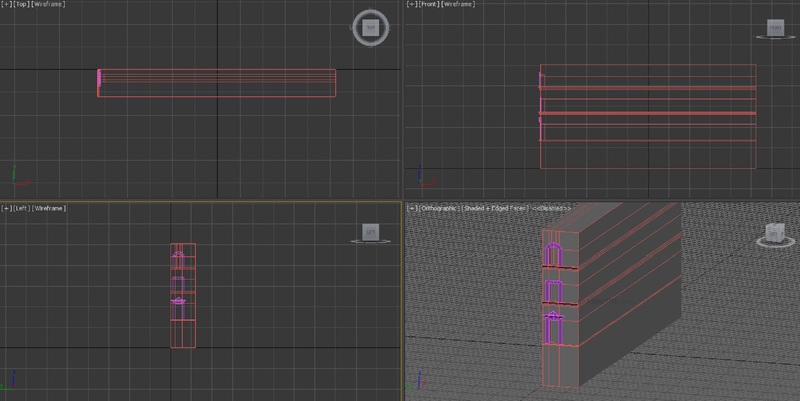 Other things like pillars or window frames had been all modelled into one shape of the building, its much easier and less straining on the polycount to model pieces seperately and simply push them or snap them to the model. Take into account buildings next to you- this will be a test of our group work, even if the building next to yours isnt you building you will have someone else next to yours and if its all going to work in the engine you need to make sure that they snap together otherwise we will have a street full or gaps or overlapping z fighting. Topology- breifly raised before when i helped james, having ngons or loops where they should or shouldnt be can be of detriment to your model. Mainly in texturing it could cause skewing or stretching, its mainly fairly simple to fix topology but taking time to do it will be vital to the project. Building specific collisions- we breifly dipped into engine ideas moving forward in the block out, what we mean by building specific collisions is most buildings have different shop fronts e.g. my building m&s has a fairly deep entrace to the shop front due to showcasing windows whereas what is now the card factory has a very flat shop front. So with that in mind building specific collisions will have to be made to give the game that extra realism and immersion, because if we did one simple block across both sides of the street the player would be confused why he/she couldnt at least go up to the door of certain buildings. This concludes our group critique my personal reflection is that i was concerned slightly with the professionalism of some students during this as its such a vital part of our project, but the issue has been raised and hopefully next time this wont be a problem. Group critique will be a regular occurence in the project from now on so that any issues can be resolved quickly and effeciently. Categories: Client Project, Year 2 | Tags: 1960s, 3D, Autodesk 3ds Max, Client, Design, Design Process, Environment, feedback, Group Critique, Heritage Hull 1960s, Hull, PHASEgaming, research | Permalink.